Exciting announcement! 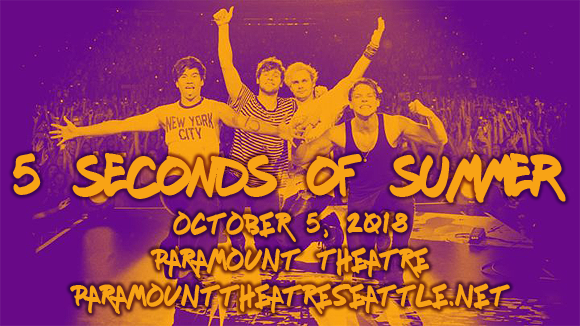 Aussie heartthrobs 5 Seconds of Summer are coming to Paramount Theatre Seattle on Friday 5th October 2018! Promoting their upcoming third studio album Youngblood, the pop rock fourpiece will be performing hot new material, including their recent smash hit single "Want You Back"! Formed in 2011, 5 Seconds of Summer are an Australian pop rock band, whose rise to fame began with the band releasing covers and original songs on their YouTube channel. The band soon caught the attention of British boy band One Direction, who invited them on their 2013 Take Me Home Tour. Their debut single, “She's So Perfect”, was released in early 2014, topping the charts in Australia, New Zealand, Ireland and the United Kingdom. Their self-titled debut album was released later that year and reached number one in eleven countries. 5 Seconds of Summer's thrid studio album and newest record, Youngblood, will be released in 2018.